I don't think I've really emphasized this on the blog before, but if you sew knit fabrics, your sewing machine needle needs to be of the ball point variety. If you've sewn any type of knit, you're probably already aware of that. 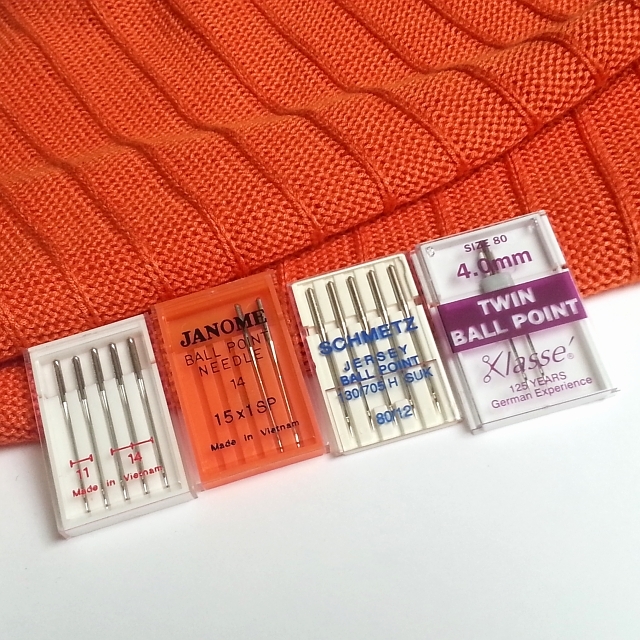 When working with bulkier or openwork sweater knits, a ball point needle is extremely important. A ball point needle will slip between the yarns of the fabric. If your needle is other than ball point, there's a good chance that the needle will pierce the yarns of your fabric -- not a good idea with a fabric that tends to run if the yarn gets damaged. As I understand it, a stretch needle is generally used for knits made with lycra or elastic. It can also be used to sew a sweater knit. The stretch needle also has a ball point. The difference between a stretch needle and a regular ball point needle has to do with the size of the "scarf", the indentation on the shaft directly above the needle eye. (See Threads Magazine: Machine Needle Know-How.) My serger uses HA x 1SP needles, a type of stretch needle. This isn't the same as the standard ball point for a sewing machine. So what happens if you mistakenly put the wrong needle in your serger? If you put the standard sewing machine ball point in, when it's the HA x 1 SP that's required? I did this just before my serger went "out of time" last year. The wrong needle may be what caused the problem. I don't know. Apparently "Miss Fairchild" had a similar issue. (Read this patternreview thread. It's not until the middle of page 4, that we learn its resolution.) So that I don't make that mistake again, I now write the word "serger" on the back of all my serger needle packages. 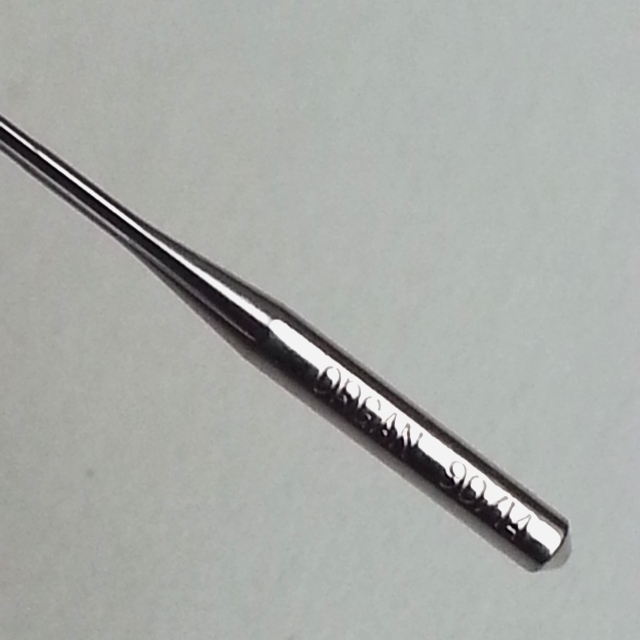 There is often brand and size info stamped onto the shank of the needle. But have you ever noticed that a light reflection often appears on the needle shank just where the pertinent size info is stamped? I've recently discovered it's easier reading this info by zooming in with the camera on my phone, rather than with a magnifying glass or (ha!) the naked eye. Yes, size matters when it comes to sewing machine needles. And so does shape. Remember that many household sergers often require a special needle. Please be sure to choose the right needle for your project and your machine.